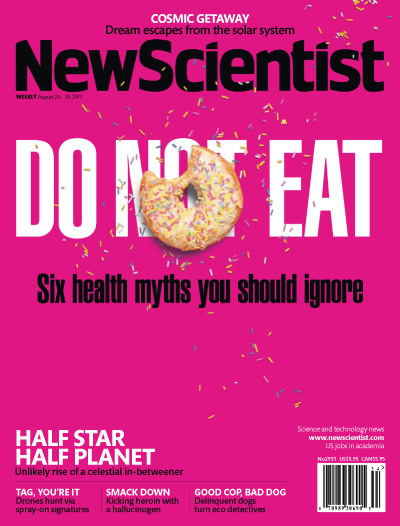 This week’s New Scientist has an article debunking some widely held notions about nutrition. Here are four of them. 1. It is not necessary to drink eight glasses of water a day. It is not necessary to drink pure water at all. It just isn’t true that by the time we are thirsty we are already dehydrated. ‘So relax and trust your body.’ If you visit any primary school, chances are you’ll see children clutching their water bottles like comforters (well, I hope it’s water). Are these for the comfort of the children or the parents, I wonder? 2. Sugar does not make children hyperactive. Children go to parties where (A) they eat sugary things and (B) are excited. It does not follow that A causes B. Sugar rots the teeth though. 3. Being a bit overweight is—wait for it, wait for it—good for you and will stave off the grim reaper for a bit! Deo gratias. Yes, yes, I know I’m more than a bit overweight, but still …. 4. The notion that we should eat like cavemen is bunkum. Crops and animals then were quite different from crops and animals now. There is no evidence that cavemen were healthier than we are. Evolution ‘doesn’t care if we drop dead once we’ve raised our children and grandchildren’. Why does it give me such joy that these are debunked? I suppose because I find zealots tiresome. The nanny state goes too far. People tell us what to eat, what to drink, how to eat and drink, when to eat and drink, how to sit, how to stand, how to exercise, how to walk, what to think … and more. Do-gooders used to tell us that eggs were bad. Eggs are now good. I heard a whisper recently that salt wasn’t the satanic substance that we had been led to believe, and that maybe if I think I need salt it’s because my body is telling me I do (or perhaps I’m addicted to it). When I was in my 30s I became fascinated by the Mitford sisters (novelist, farmer, fascists, communist, writers) and remember that their mother, Lady Redesdale, believed that ‘the good body’ would heal itself more effectively without the intervention of doctors or medicine. Was she barmy? She took this to the point of having the doctor remove a child’s appendix on the kitchen table. Maybe a bit barmy. I think I’m remembering right that in my early days as a clinical medical student, an eminent surgeon told us that in his opinion people should let the body do the what-comes-naturally. Amen, amen! This entry was posted in A great future behind me, Medical, Pastoralia by Rambling Rector. Bookmark the permalink. Hello Gary – good to hear from you! I could have written more and been much ruder, but I yielded to (unnatural for me) moderation.